best way to create a basic app? Poll: What do you consider portable? Run95 is a copy of the Windows 95 Run Dialog Box. The implementation as a standalone executable file has a great advantage over the original: you can bring it everywhere and launch it using a hotkey (if your portable program launcher supports it). How to extract: Download the ZIP package and extract to a folder of your choice. Launch Run95.exe. 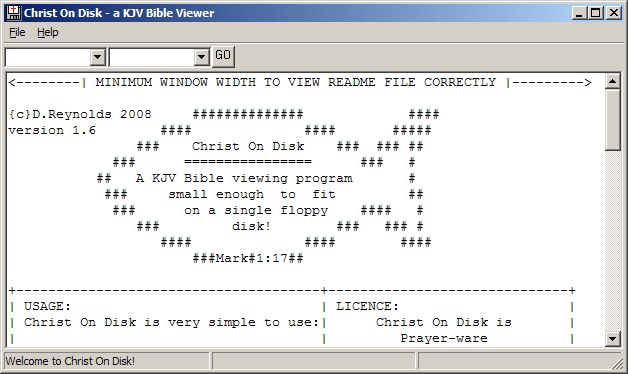 Christ On Disk is a tiny application for viewing the entire King James Version of the Bible. It displays any of the 1189 chapters in the whole Bible, both Old and New Testaments. NOTE: main site download is offline, linking to Softpedia mirror (thanks Mixture). How to extract: Download ChristOnDisk1.x.exe to a folder of your choice and launch. Can it take confessions, though? I don't want to feel guilty about taking communion without confessing and I really do spend more time with my computer than I do at church. Site's down and software no longer available for download, apparently due to an attack.